As the refugee crisis unfolded in Europe and the photo of the lifeless body of a three year-old on a Turkish beach galvanised calls for action, an outpouring of public pressure has forced the Abbott government to take 12,000 Syrian refugees. The 12,000 will be on top of the existing humanitarian intake of 13,750, but the increase has come grudgingly and with a divisive twist. It is a “one off” increase that some government Ministers are saying will take more than two years to fulfil. The Abbott government cut Australia’s humanitarian intake from 20,000 to 13,725 when elected in 2013. So in terms of numbers, this is not as generous as the government tries to make out. Germany is accepting 12,000 refugees a day. When you consider the size of the humanitarian crisis it is a pathetically small increase. Even some Liberal backbenchers were suggesting 50,000. Secondly the stipulation that Australia’s selection would be from persecuted ethnic and religious minority groups is transparently anti-Muslim. Christopher Pyne tried to cover this up—saying that the government would not be singling out any particular group. This has re-introduced a discriminatory basis for Australia’s refugee program. Greens leader Richard di Natale rightly declared, that there is more than a whiff of White Australia about this policy. Abbott is taking the opportunity to inflame the anti-Muslim sentiments being pushed by his backbenchers Cory Bernadi and George Christensen who claimed, “Reports of Islamic State terrorists posing as refugees is more reason to prioritise Syrian Christians”. The government’s insistence that it will only accept women and family groups is a (not-so-silent) dog whistle to Islamophobia; with the clear implication that single Muslim men could be a threat to national security. The Muslim community has hit back at the divisive policy. “We are obliged to condemn in the strongest terms the suggestion that priority should be given to people of one faith over another. It is truly abhorrent that in Australia in 2015 we are hearing that federal politicians have specified that there be “no more Muslim men” in the proposed refugee intake. Widyan Fares, media officer for Lebanese Muslim Association told a Sydney Press Conference. Abbott has disgracefully used the refugee crisis to try and win support for extending Australia’s military intervention from Iraq into Syria. But bombing IS in Syria will only make the situation worse. 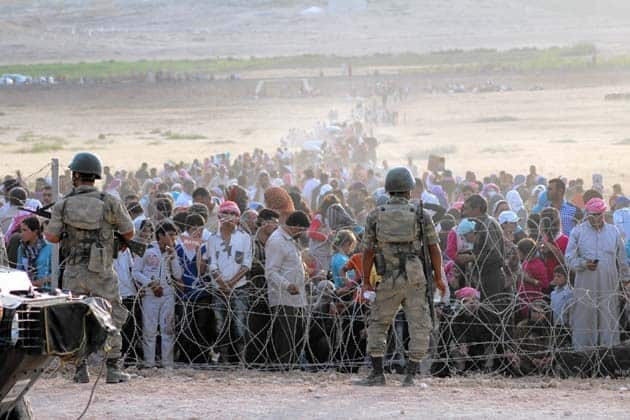 The Syrian refugee crisis is four years old and the vast majority of refugees are fleeing the barrel bombs and brutality of the Assad regime. Some estimates say up to 85 per cent of the civilian causalties have been caused by Assad. It was the sectarian divisions fostered by Western imperialism in Iraq that is ultimately responsible for the growth of IS. Lastly, the Abbott government, and the Labor Party, have turned their backs on the Syrian and other asylum seekers rotting in Australian-run detention centres in Villawood, Nauru and Manus Island. But there is no difference between the refugees in Syria and those in Australian detention. The homes of both the Syrians in detention in Villawood, in Aleppo and Deraa, have been bombed by Assad, the latter as recently as six weeks ago. They have been held in detention for 26 months, first victims of Assad, now victims of Australia. But this is a sick joke—the government actually cares nothing for the refugee women being sexually assaulted on Nauru. Abbott’s callous “Stop the boats” slogan has taken a battering. Now the campaign has to demand to free the Syrians in detention and to close Nauru and Manus now!